Nova Scotia's cannabis retailer is being accused of violating federal regulations by "glamourizing and normalizing" marijuana, but the Crown corporation says it's simply educating consumers. The Nova Scotia Liquor Corporation recently unveiled the design of its cannabis stores, which divides products into four distinct categories: relax, unwind, centre and enhance. There will also be tablets at tabletops allowing customers to browse products and "discover your experience" once the stores open in October. Dr. Simon Sherry, a psychologist and professor at Dalhousie University, issued a news release Tuesday saying the signage promotes cannabis in a way that's attractive and appealing, contrary to the Cannabis Act's section on promotion. "There's a danger in all this. What our government and the NSLC are doing is that they are glamourizing and normalizing cannabis use," Sherry, who has written a letter to Health Canada Minister Ginette Petitpas Taylor outlining his concerns, said in an interview. "They're making it appealing, and they're making it attractive, and when cannabis gets glamourized and normalized, more and more people start to use it, so more and more Nova Scotians are going to be encountering the risks and the harms associated with cannabis use." Sherry points to NSLC signage that promote various cannabis strains as "soothing," "relaxing and calming" or offering "livelier experiences" that "invigorate the senses." The Cannabis Act prohibits promotion in a manner that "evokes a positive or negative emotion about or image of, a way of life such as one that includes glamour, recreation, excitement, vitality, risk or daring." 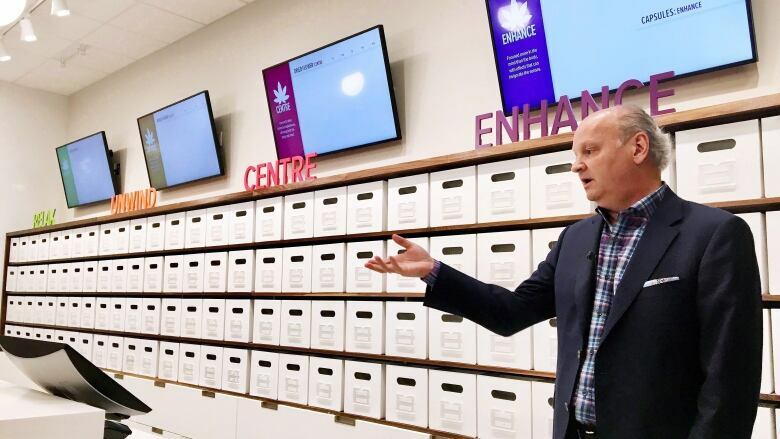 David DiPersio, senior vice-president and chief services officer for the NSLC, said the product classifications were developed to educate consumers about how different strains of cannabis affect the mind and body. "What we are doing here, in a very subtle way, is educating our consumers to the fact that this particular strain would create a different type of experience than another strain," said DiPersio. "It's a platform to educate our consumers. It's also a platform to educate our stores so that they have a program upon which they can use to actually educate consumers if they're asking questions. "We feel it would have been a disservice and frankly a bit dangerous to our consumers if we weren't able to actually explain what experience could result from the usage of a particular strain of cannabis." DiPersio said federal regulations were top of mind as the corporation designed the program, and it has ongoing calls with Health Canada through the provincial government. No concerns about the signage have been raised thus far, he said. "We firmly believe that the model Nova Scotia has in place to retail cannabis on Oct. 17 achieves the goal of legalizing cannabis in the most responsible manner," provincial government spokesman Andrew Preeper said in an emailed statement. Sherry said the NSLC's messages appeal directly to addiction-prone people. He noted there are two key "motives" for using a substance like cannabis: enhancing experience and trying to relieve stress or anxiety. "We know that individuals who have these tension-reduction motives and have these enhancement motives are especially likely to escalate to problematic use of a range of drugs including cannabis," he said. "And so these ads are directly appealing to the motives for why people are likely to use and abuse cannabis... Whether it was intentional or not, this seems like a targeted message towards addiction-prone individuals." He added that he supports the legalization of cannabis, but wants it done in a "cautious, thoughtful, and evidence-based way." He said cannabis use should be a personal choice based on accurate information. A lack of direction from Health Canada? Sherry has previously also raised concerns about the stores being located inside existing liquor stores, saying it poses a public health risk. Trina Fraser, an Ottawa-based lawyer who advises the cannabis industry, said Tuesday the situation is complicated without clear direction from Health Canada. "I don't agree that we're going to further advance the overall objectives of legalization by shoving exaggerated, dire warnings in people's faces every time and at every juncture where they could possibly be considering buying cannabis," she said. "If we make it that unpleasant of an experience, we're never going to convince consumers to buy their cannabis at a legal source instead of an illegal source." On the other hand, Fraser said the Act allows people to promote cannabis using brand preference and "informational promotion," but only if the seller meets certain criteria, including selling from a place prohibiting minors. In other provinces, where there are designated cannabis stores, sellers would fall into that category. But with Nova Scotia, minors can enter the NSLC with their parents, so it becomes more complicated, Fraser said. She added that "informational promotion" is a vague term. While NSLC's signage could be construed as informational, she said cannabis affects different people in different ways and someone might not necessarily feel "relaxed" or "enhanced" after using cannabis. Health Canada did not immediately offer a comment Tuesday.